Capital of Iceland is famous for its beautiful landscapes, interesting museums and delicious local food, however if you prefer less mainstream and more cozy places, this list is definitely for you. This popular vegan cafe is well-known for its laid back atmosphere and delicious food. From the name of the place, you can guess that the theme of the place are old records, so it is not a surprise, that in the cafe one can pop a favourite vinyl on the record player. But the cafe decided to go even further, for now on each Saturday from noon till late there would be a record shop, when you will be able to buy a beloved music. As surprising as it sounds, it is actually a place where you can do you laundry, which is good enough, because during your trip, you might need one. Upstairs there is a tiny but remarkably cozy coffee shop. This cafe is perfect if you want to hang out with your friends, but also if you prefer to relax with a nice cup of cappuccino and a book. There are plenty of books on the shelf, that any customer can enjoy will drinking their famous coffee. Just from the photo of the building, you can say that the place is perfect for taking photos: glass construction, with sharp angels and minimalistic features. The entrance to the building is free and you can also enjoy a small record shop inside. The hostel, which was previously a biscuit factory, is a popular place among both tourists and locals. It is famous for its bar, that gets really busy in the evening. With a prefect view on the sea and relatively cheap price, it is win-win situation for sure! Another amazing bar will certainly give you a funky bar vibe. As can be seen from the name, the theme of the place is inspired by Big Lebowski film and the place is just absolutely fantastic. It has a good variety of booze, with dozen types of White Russia and also a bowling alley! 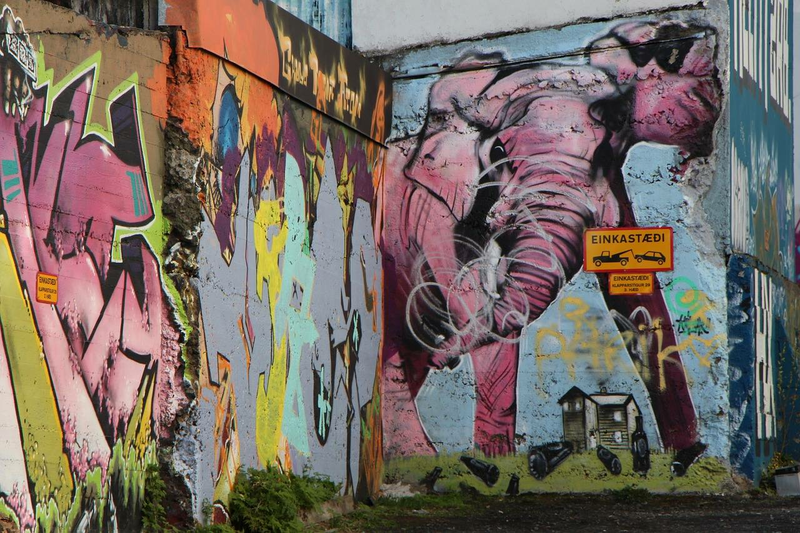 And last but not the least, there are tons of street art that can be found in Reykjavik. So if you have some time, we highly recommend you to walk around city and just embrace the local culture and art. It is certainly something worse seeing and would look awesome on photos.